People come across a large number of injured, sick, exhausted, orphaned or otherwise handicapped wild animals. Injuries often happen as a consequence of human activities such as rapid urbanization, landscape exploitation, transportation network development, civil engineering, energetics, etc. 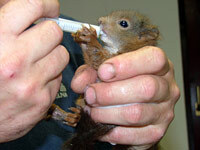 Rescue of injured or otherwise handicapped wild animals has been a permanent, integral part of ČSOP agenda. Wild Animal Rescue center workers provide all injured animals with a professional–level care. National Network of Rescue Centers is a unique project that ensures animal rescue throughout the area of the Czech Republic. This project originated in 1997 and has been arched over by ČSOP. Rescue centers are associated in the National Network. Each center covers a designated area, which doesn’t overlap with any the other ones. Altogether these areas of activity cover the area of the entire country. Any rescue center is obligated to provide each found handicapped animal with a complex care including first aid, vet treatment, therapy and rehabilitation. Ideally, the rescue center releases the animal back to the wild. To date, National Network of Rescue Centers is comprised of 32 rescue centers. Their list, contacts and areas of activity are available at the project’s website http://www.zvirevnouzi.cz/ (so far in the Czech language version only). The website provides information about the closest rescue center if an injured animal is encountered. Rescue Center employees also provide advice on how to handle an injured animal and how to proceed further. Depending on the situation, the animal may be either handed over to one of the centers or picked up by one of the employees on call. Rescue centers in Nation al Network admit around 20,000 injured animals annually. Over 50 % out of these are fit to be returned back to the wild. Handicapped animals that cannot be released back to the wild are sheltered at one of the rescue centers, where they remain in permanent care obtaining exhibition and educational role for rescue center visitors. Wild animal rescue and care are extremely financially consuming. The work provided by rescue centers is funded from a variety of resources including the public funds, private companies and individual donors. One of the important resources for funding is the public fundraiser campaign Animal in Need that was initiated by Czech Union for Nature Conservation. The public can contribute by sending gifts to the fund account 33 55 33 22/0800 or by sending a donation DMS. Gifts may be either donated to a specific rescue center or to the general fund. In case of the latter, resources are then redistributed among all the centers in National Network. Up to CZK 1,000,000 is collected from donor gifts each year.